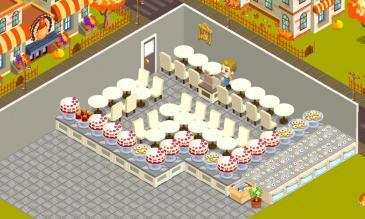 The purpose of this is to break down the mechanics of Bakery Story so that you can maximize your profits. Be warned some of this math might get troublesome at times, and some amount of rounding and estimating is present so your results will vary. Also this all assumes you have 100 customer happiness meaning you will be getting 1 customer a second entering your bakery and you are not blocking your doors (which can cause surges when you unblock). I will also be ignoring: ramp up times like the time it takes for your bakery to fill up when you log in, since it washes out the longer you stay in, out of sync errors causing it to forget the last x customers that were in your bakery, and broken hearts. 60 seconds / 75 seconds wait per customer * 27 customers = 21.6 plates a minute. 41,472 coins if you spend 8 hours offline. 21.6 servings / (1,225 servings / 22 hours to cook / 60 minutes in an hour) = 23.28 round up to 24 stoves to bake all those red velvet cakes in order to keep up. So if you are a higher level you only need 24 stoves while you are offline in order to maximize your profits, if you have more than 24 stoves you will need to spend time online with an efficient bakery to keep up. If you have less than 24 stoves mix in faster recipes to keep fully stocked. The goal to maximizing your profits while online is to serve and get the customer out the door faster than the rate they can come in. The rate they can come in is 1 a second, and with a cap of 27 customers in the bakery means if you can have each customer spending less than 27 seconds in the bakery then you will process one plate a second, or 60 plates a minute. Now to be safe your goal should be 26 seconds. Now 15 of those seconds are gone off the top from the customer eating and waiting/getting to the register. That means customers can only spend 11 seconds walking after the register around your bakery, before your max through put gets hurt. Your registers need to be within 5 squares of their respective door. It is best to have them at the edge of that range to minimize the walking being done by the customer. This layout has just enough chairs to serve the customers. In its case the average time spent walking is: 9.78 seconds. Round that up to 10 seconds + 10 seconds to eat + 5 seconds to register = 25 seconds total which is under the magic 26 second mark meaning that it can achieve the max profit while online. Kind of sad that something so basic can do it, but you really don’t have to do anything crazy (even though I do but that is just because I am crazy). If you want to maximize the online profits it is still best to go with Red Velvet Cake, but this time around if you want to sell red velvet cake and leave your phone/tablet on 24 hours a day and not use it for anything else then it would take 65 ovens to keep up. If you average 50/50 then you will need 44 ovens to keep up. So plan your recipes accordingly. The amount of thought that went into this is insane. I’m seriously impressed.